One evening last fall, Aubrey Grant was playing his regular show for tips at the Mellow Mushroom, a pizza place located amid Nashville’s famed honky-tonks on Lower Broadway. As usual, there was a group of tourists in the audience soaking up Music City’s charm. It’s not unusual for these visitors to be wowed by the quality of the performers working the strip for a little money and the hope of making the connection that will open new doors of opportunity. On this day, Ashburn resident Peter Hegedus, his wife and some friends were in the audience during their first visit to Nashville. “We heard his voice outside. We walked inside and fell in love. His voice is so unique,” Hegedus said. Not only did they become instant fans, they committed to helping introduce Grant to a wider audience. First, that was helping to get him over the 5,000 likes threshold on Facebook at Christmas time. Then, in early January, Hegedus sent a proposal for Grant to come to Loudoun for a tour of Loudoun’s growing roster of music venues. Since then, he’s been learning the ropes of serving as a performer promoter to build a tour. Old 690 Brewery was the first to sign on and starting April 5, Grant will perform six shows during a two-week tour that will take him from Sterling to the West Virginia border. It will be the first visit to Loudoun for Grant, a Blacksburg native. Like many drawn to Music City, Grant’s road to Nashville had some curves. After earning a degree in musical theater at the University of the Arts in Philadelphia, he moved to New York City to break into the business, eventually landing a role in an off-Broadway production. That was followed by a six-month stint performing with a troupe on a cruise ship touring the Caribbean. After that contract ended, he was set to return to New York City, but it didn’t feel right and, after a heart-to-heart conversation with his father, he went to Nashville instead. That was five years ago. 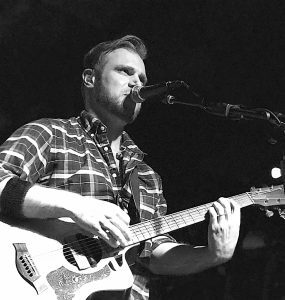 In addition to playing two or three shows a week on Lower Broadway, Grant has been writing songs and has released two EPs of original music—2015’s “Thinkin Bout You” and last year’s “Slow Burn.” He’s also co-written a song, “Stay With Me,” with chart-topping songwriter Phil Vassar that is included on Vassar’s latest recording. Grant said visitors to Nashville’s honky-tonks are often surprised by the quality of the performers playing for tips on the strip. “We get a lot of people saying really complimentary things, like ‘why are you doing this,’” Grant said, but the support from the Hegedus family has been tremendous. It’s the first time strangers have offered to do so much to promote his career. “They took it very seriously,” he said. Not only will Grant be performing at Loudoun venues during his visit, Hegedus also has arranged for him to play for service men and women recovering at Walter Reed Hospital. Grant says his sets will be a mix of originals and special covers, country, blues, soul and rock—“anything that is meaningful to me”—as he shares a snapshot of his life with audiences. For details of Grant’s Loudoun tour and his background, go to aubreygrantmusic.com.